This updated Aragon model is truly a Marbella treasure... tastefully remodeled with quality in mind, it features one of the largest lanai, pool and spa areas in the entire Villa section! Totally private, it creates a courtyard-style ambiance... and so spacious, it can accommodate large parties for casual entertaining or your personal enjoyment. The open-plan living room is showcased by disappearing, triple sliding windows overlooking the pool, wet bar and L-shaped Dining Room. The fabulous Kitchen features a Bfst bar, custom wood cabinetry, granite counters, stainless appliances... a chefs delight! Sunny Breakfast Room boasts a bay window overlooking the pool. Both Baths have glass enclosed showers, custom cabinetry and granite counter tops, and the en suite master bath features a soaking tub and separate water closet. The Master has wood flooring and 2 walk-in closets. The 2nd Bedroom easily accommodates your family/guests and the gracious Den features beautiful office wall units and custom window treatments. Numerous upgrades include: 10' volume ceilings, crown molding, ceramic tile flooring, custom window treatments, plantation shutters, new lighting fixtures, custom ceiling fans, new plumbing fixtures, saltwater pool conversion with solar and gas heat - resurfaced pool/spa. The Lanai has custom pattern-textured and finished. 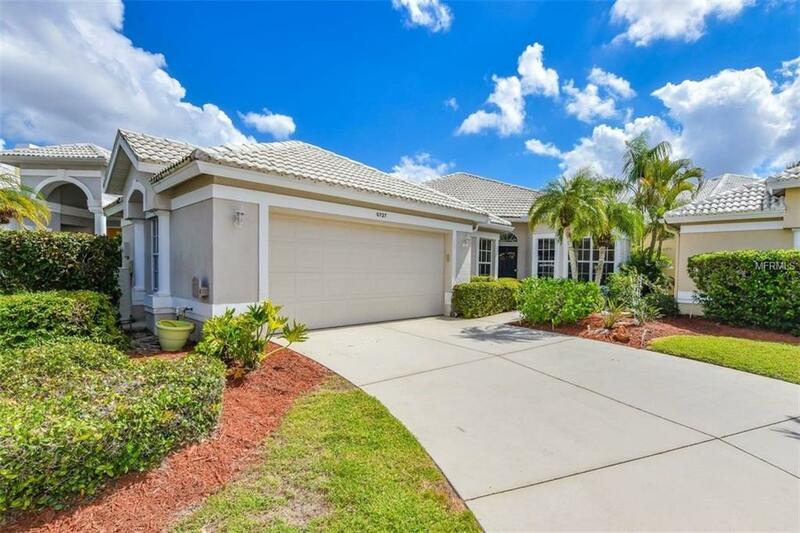 Here is your model-perfect, affordable home... ideal for entertaining, in a desirable, established gated community on beautiful Palmer Ranch. Pet Restrictions Must Be Leashed. No Dangerous Breeds.